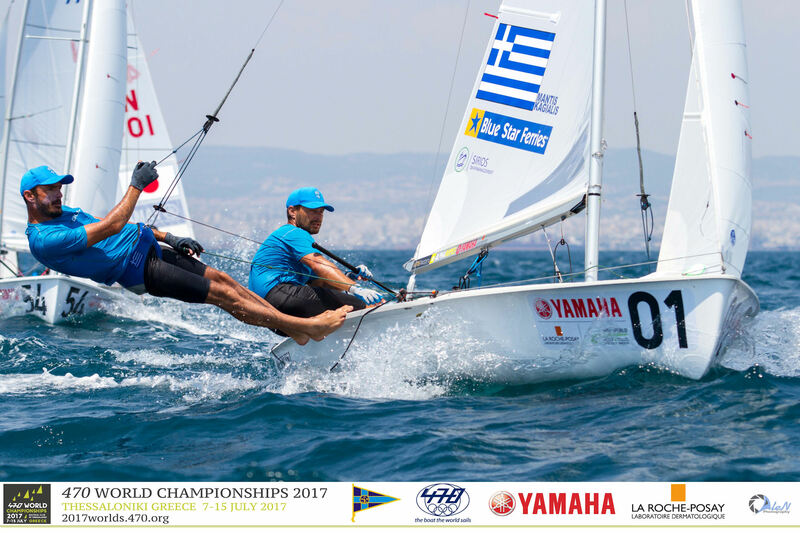 A cracking opening day at the 2017 470 World Championships in Thessaloniki, Greece rewarded teams with a 3-race scorecard. A two-hour postponement ashore waiting for the thermal breeze converted to 8-10 knots for the first race, building to 15-16 knots, under a clear blue sky. The glamour day saw racing for the one hundred and thirty-three teams from 32 nations get underway around soon after 1400 hours across the two race tracks. 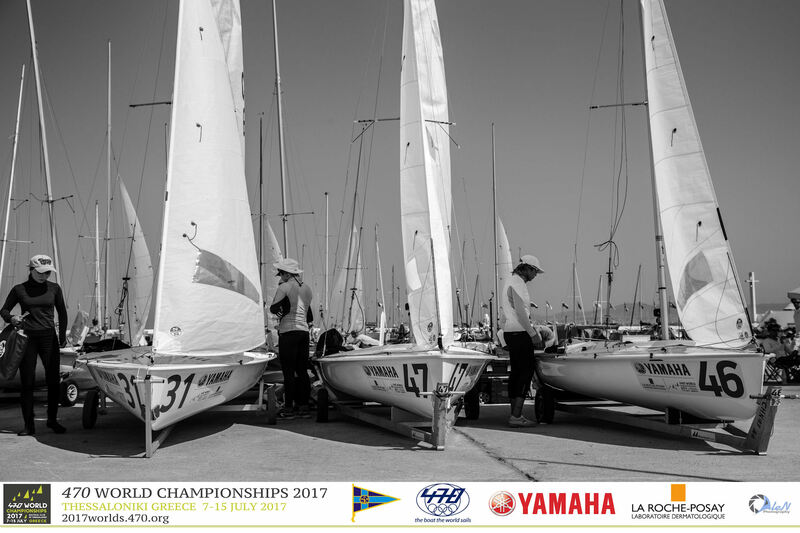 All fleets are split into yellow and blue fleets for the 5 race qualification series, and will be reseeded overnight for the final 2 qualification races on Tuesday. 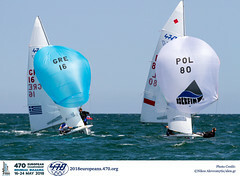 From Wednesday’s day 3 of racing, the fleets will contest six final series races, before the top ten men and women teams advance to the Medal Race on Saturday. Anton Dahlberg/Fredrik Bergstrom (SWE) claimed a 1,2,1 to lead the 470 men at the end of the opening day, and sit on a 3 point advantage over Mat Belcher/Will Ryan (AUS) in second. Third to Turkey’s Deniz Cinar/Ates Cinar. Carrying the world #1 ranking on their bow are Greece’s Panagiotis Mantis/Pavlos Kagialis. 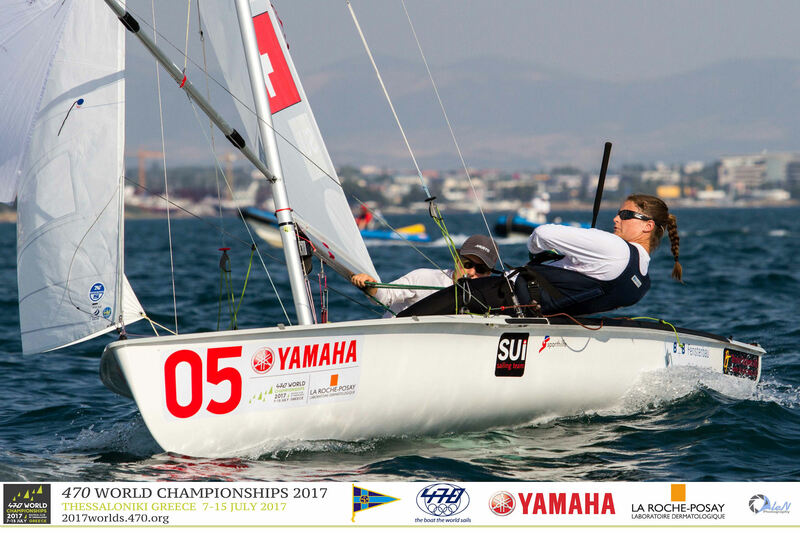 The Rio 2016 Olympic bronze medallists have every ability to mount a credible bid for the World Championship and most recently won the Sailing World Cup Final in Santander. Their opening scorecard was a 10,4,2 and 5th overall. 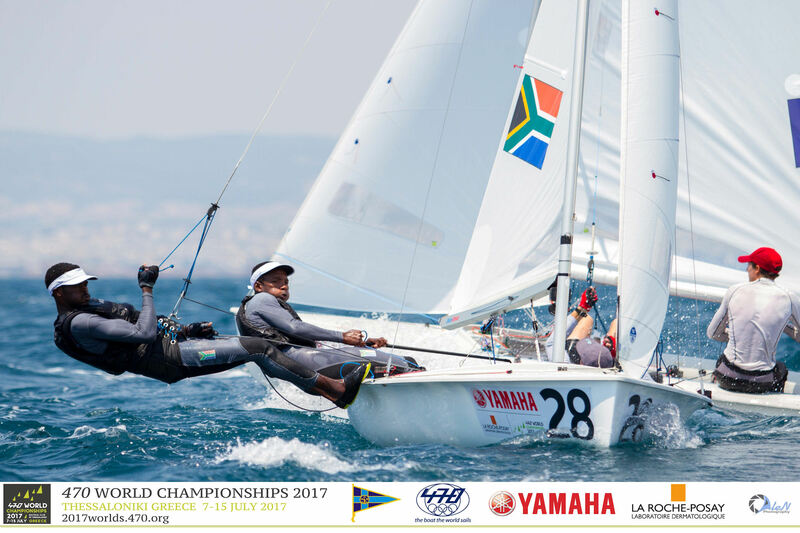 South Africa’s Asenathi Jim has come a long way since he competed in his first international event, the 2010 420 World Championships, including racking up two Olympic appearances in London 2012 and Rio 2016 with crew Roger Hudson. Here, Hudson has switched to coach and Jim, or “Squirrel” as he is more affectionately known, is racing with Sibu Sizatu. An outstanding day for the pair, scoring a 4,6,12 and placing 11th overall. 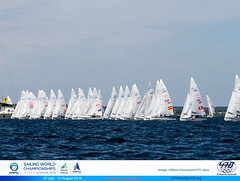 Sizatu is competing in his first ever 470 World Championship having passed through an intense selection process. “It wasn’t easy to be selected to compete here,” continued Sizatu. “There are a lot of crews back at home and I am one of the crews, but we needed a lighter team to come here and we had a trials and I got the slot. It is a really good feeling to be here. Another performance of note went to 2016 470 Junior European Champions, Giacomo Ferrari/Giulio Calabro from Italy. 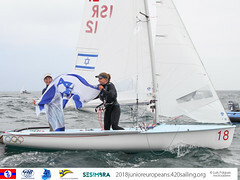 The pair bucked the fleet by making an appearance inside the top 10 at the 470 Europeans in May, finished 3rd at the Sailing World Cup Final and launched today’s World Championship assault with a win. Follow-up scores of 14,15 places them in 19th overall. 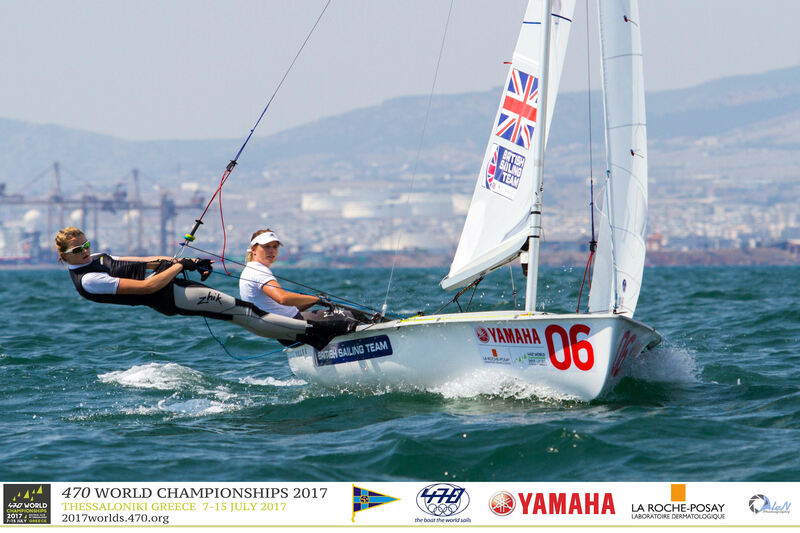 A standout performance from Hannah Mills/Eilidh McIntyre (GBR), who knocked out three wins in the blue fleet. Mills, the Rio 2016 Olympic medallist has transitioned straight back into the groove, despite stepping out of the 470 this year to race a skiff. After the discard kicked in with race 3, a 3,1,1 scorecard from Slovenia’s Tina Mrak/Veronika Macarol (SLO) puts them on tiebreak in second. It’s all the experienced campaigners up front, as Amy Seabright/Anna Carpenter (GBR) place in third overall, also on tiebreak over two-time Olympian Xiaoli Wang from China who is racing her 10th World Championships, and is in fourth overall with crew Haiyang Gao. Press Releases – daily press releases will be published on the Championship website and distributed. Races will take place over two race courses, for each of the men’s and women’s fleets. 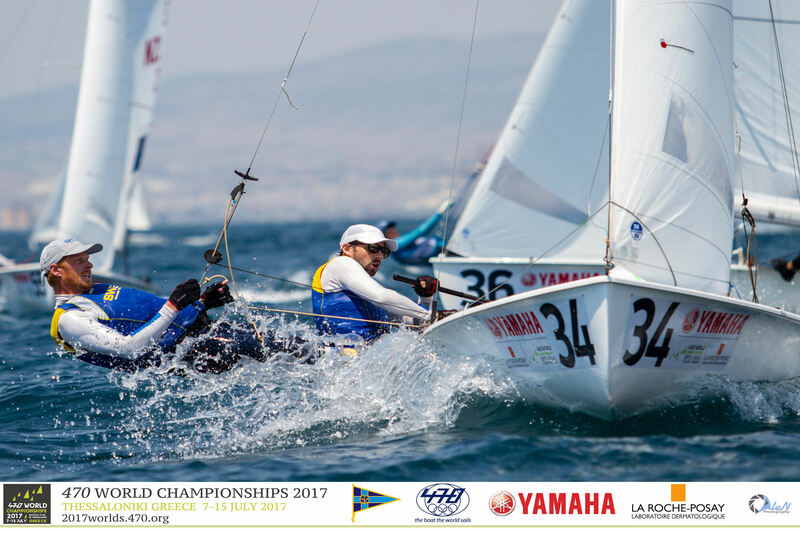 Fleets will be seeded for the five race Qualification Series into yellow and blue fleets, before being split into gold and silver for the six race Final Series. 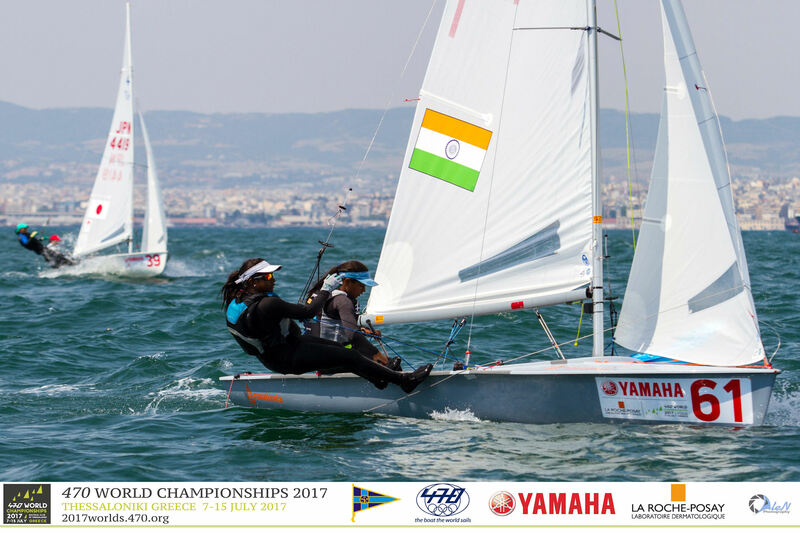 The top ten teams in the men’s and women’s fleets will advance to the Medal Races on Saturday 15 July 2017. 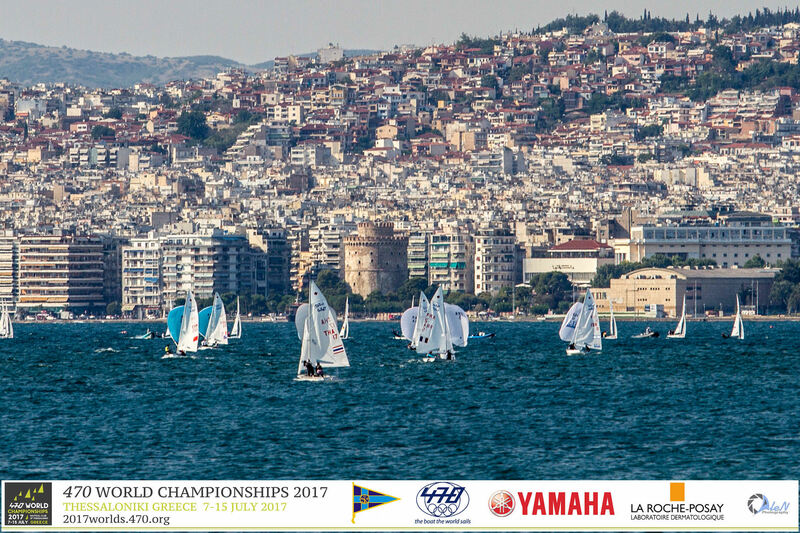 The 2017 470 World Championships is organized by Nautical Club of Thessaloniki in co-operation with the International 470 Class Association. 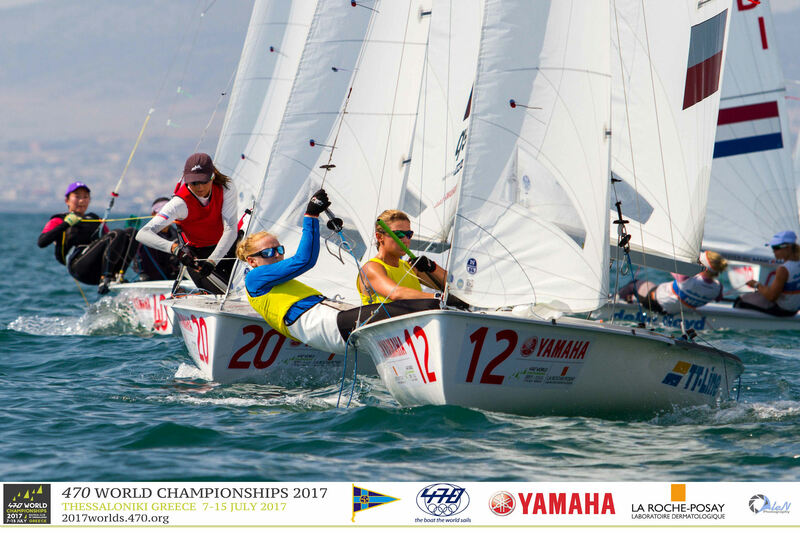 Racing starts on Monday 10 July, with a 5 race qualification series and 6 race final series scheduled for the 470 Men and 470 Women fleets, before the top 10 teams advance to the final Medal Race on Saturday 15 July 2017. 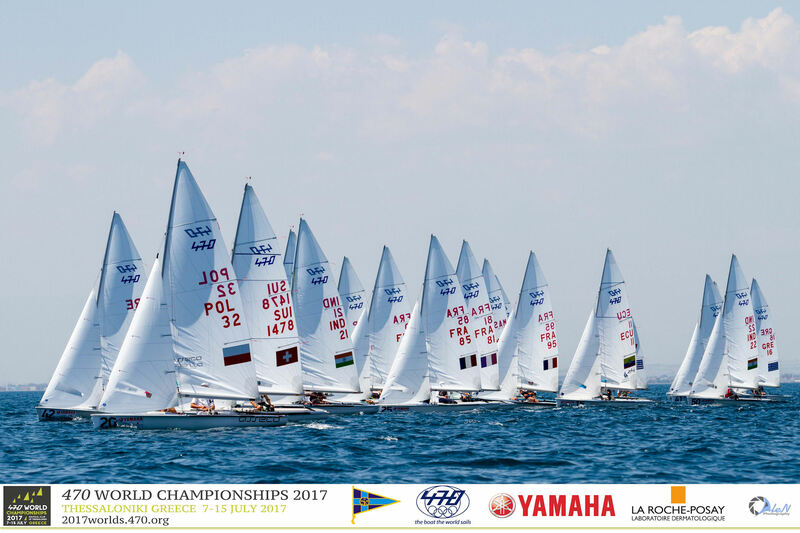 All six continents are represented in the 32 nations competing at the 2017 470 World Championships: Australia, Austria, Chile, China, Ecuador, France, Great Britain, Germany, Greece, Hong Kong, Hungary, India, Israel, Italy, Japan, Korea, Malaysia, Netherlands, New Zealand, Philippines, Poland, Russia, Singapore, South Africa, Slovenia, Spain, Switzerland, Sweden, Thailand, Turkey, Ukraine, USA.